In the initial session, the practitioner will consult with the client about their health history and the reason for their visit. 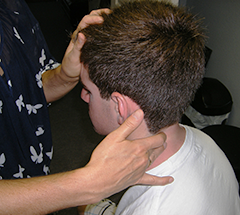 The practitioner will do an assessment to determine which procedures should be done during the session. A typical session will last 45-75 minutes. Clients are asked to wear light-weight clothing so the practitioner can easily palpate muscles and underlying tissue. The session is done with the client lying on a bodywork table. If necessary for comfort, Bowenwork can be performed with the client seated or standing. The practitioner will do a set of gentle and precise moves and then leave the room for a few minutes to allow the body time to respond, resetting the tension pattern in those muscles. This process is repeated until the session is complete. Bowenwork is unique in its ability to bring about many changes in your body without the use of force or manipulation. After a session the body continues to respond for several days unless interrupted by an injury or strong external stimulation. Because of the subtlety of Bowenwork, and the body’s continuing response to it, any forms of other therapy performed up to 4 days before or 5 days after may interfere with its effectiveness and should be avoided. When an injury, illness or dysfunction occurs, the brain immediately directs the body to compensate. These compensations have to be un-learned and the “rest” phase (parasympathetic mode) is where this naturally happens. It is recommended that you allow your body to rest. Sit for less than 30 minutes at a time. Get up and walk around for a few minutes. It is important to do this even if you are driving. Drinking extra water allows your body to expel built up toxins. Gentle exercise and stretching are recommended. Avoid strenuous exercise. No hot baths or hot tubs, a brief warm shower is best. No heat or ice packs. Because of the subtlety of Bowenwork and the body’s continuing response to it, any forms of other therapy performed up to 4 days before or 5 days after may interfere with its effectiveness and should be avoided. Please call if you have any questions about what your body is experiencing through this process. Be conscious of your posture and remember to distribute your weight evenly on both feet. It is recommended to schedule 2-3 sessions a week apart for optimal results. This helps to “set” the work that has been done. Clients who do not respond within that time tend to have a more complex condition or multiple areas of concern that may improve with additional sessions. Once your body is balanced and conditions are resolved, you may schedule Bowenwork sessions for maintenance or if re-injury occurs. I jammed my golf club into the ground during a swing and strained some muscles. It took only three sessions, each, one week apart, and I became pain-free. I was able to get back to playing golf, a game I enjoy.